Terms: credit cards and Paypal (preferred). California residents must pay 9.75% sales tax. International customers Currently not accepting international orders due to lost parcels, refused parcels, delayed parcels, intercepted parcels, and stolen parcels. There has been a recent increase in items not reaching their destination. Until we can find a shipping solution, we cannot ship to international destinations. APO, FPO and military mail is acceptable. NRC COMPLIANCE NOTICE: All gaseous tritium luminous timepieces entering the United States must pass stringent testing in accordance with guidelines set forth by the U.S. Nuclear Regulatory Commission. 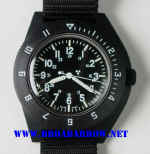 All watches sold by the Military Watch Resource have been tested at an independent testing facility, and cleared. 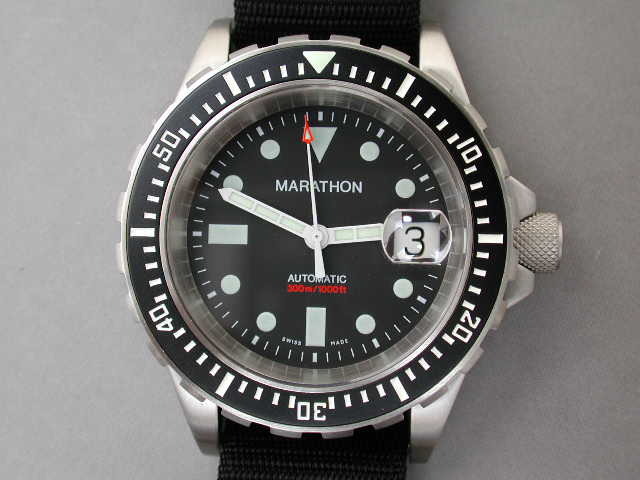 At present, only Marathon Watch Company holds the contract to supply gaseous tritium luminous timepieces to the United States Government. 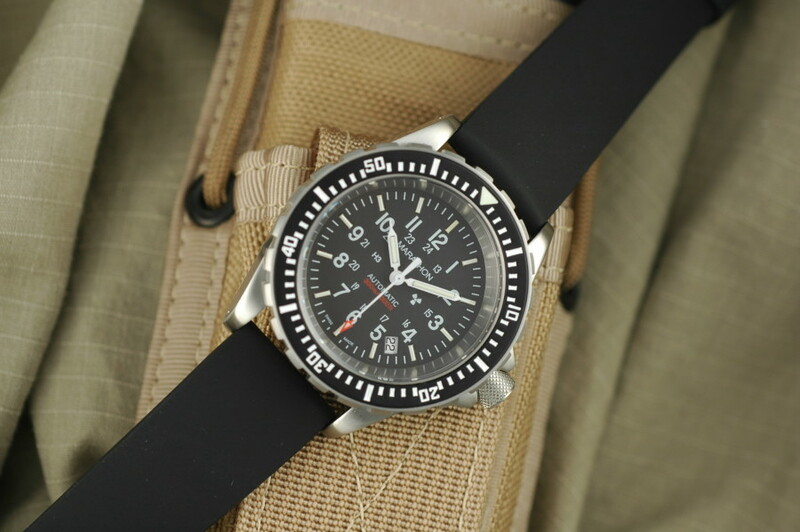 The Military Watch Resource is an authorized distributor of brand new Government contract overruns to the public sector. * Plus priority shipping & insurance. Prices to USA only. 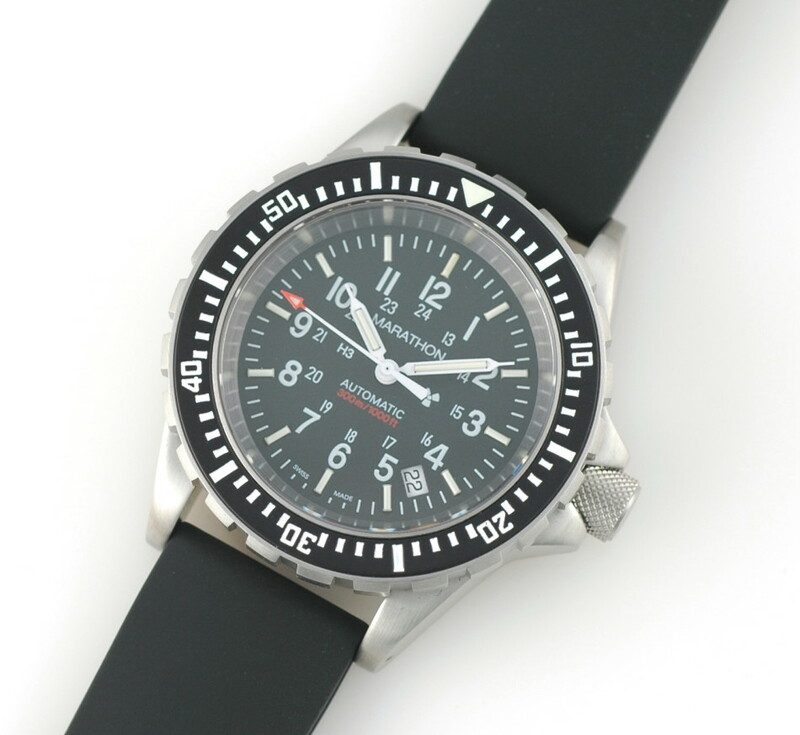 Superluminova C3 luminous dots on inner chapter ring minute, hour, and on the tip of the center-second hand. 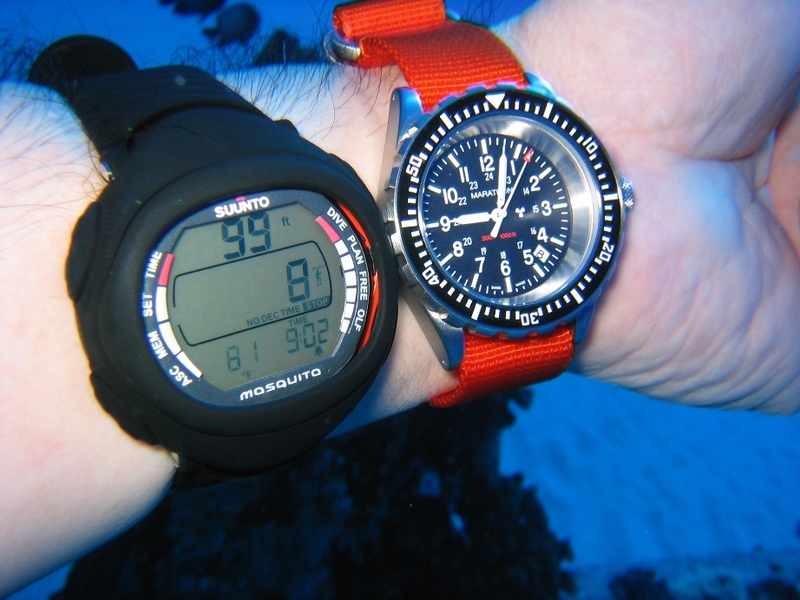 Waterproof to a depth of 300m/1000feet. 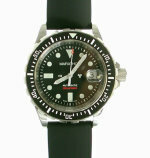 Supplied with 22mm natural rubber strap (bracelet optional). 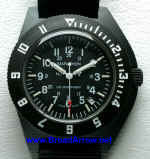 NOTE: Please understand that this is a VERY LARGE watch (same size as a CSAR) before buying. 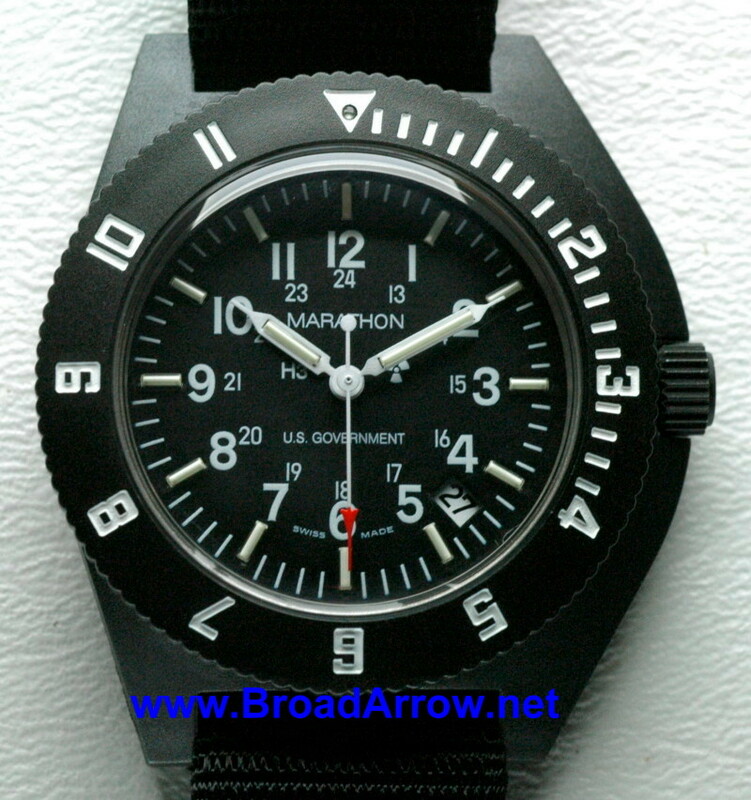 NOTE: Most current specification - dial is marked "U.S. GOVERNMENT"
Made by the Marathon Watch Company by contract to the United States (GSA), and Canadian Government for issuance to qualified military personnel. New Generation. 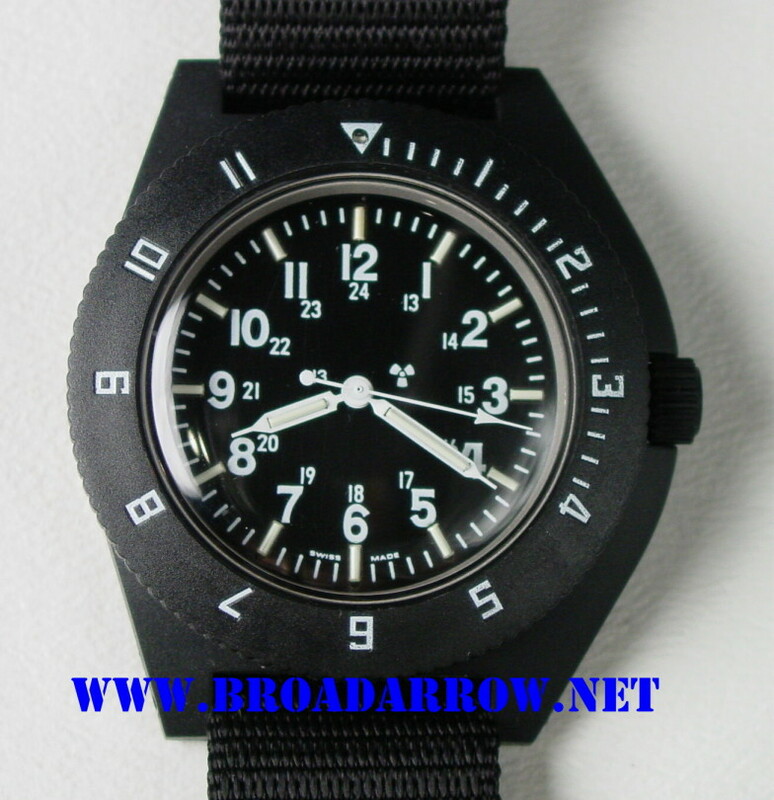 120 click new and improved bezel (staked triangle). Comes with a new Swiss made natural rubber strap with stainless signed steel buckle. Brand new packaging. 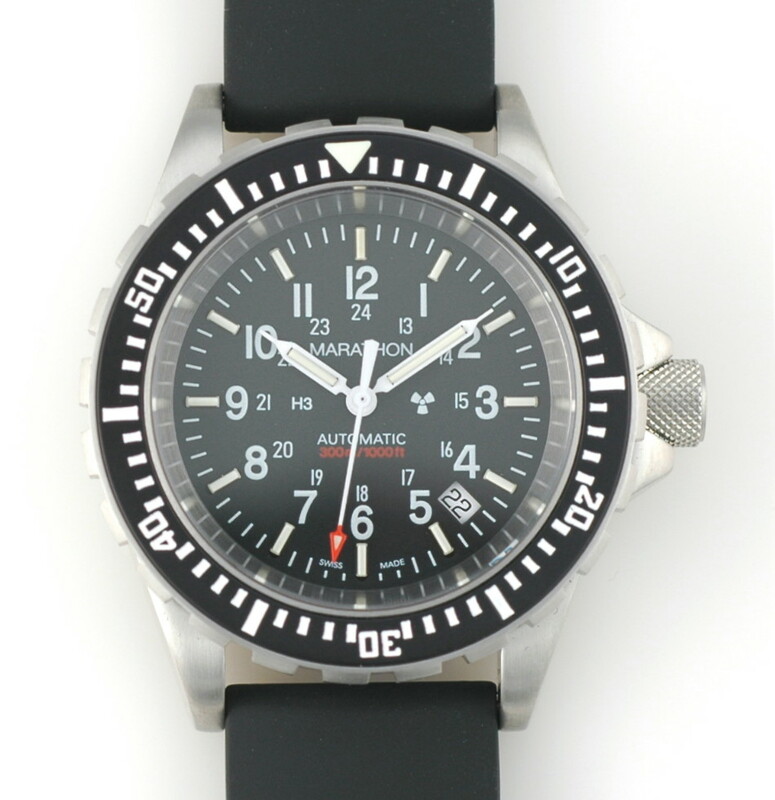 Supplied with black rubber strap (stainless bracelet optional). TSAR at 100 feet off the East shore of Oahu, under actual diving conditions. 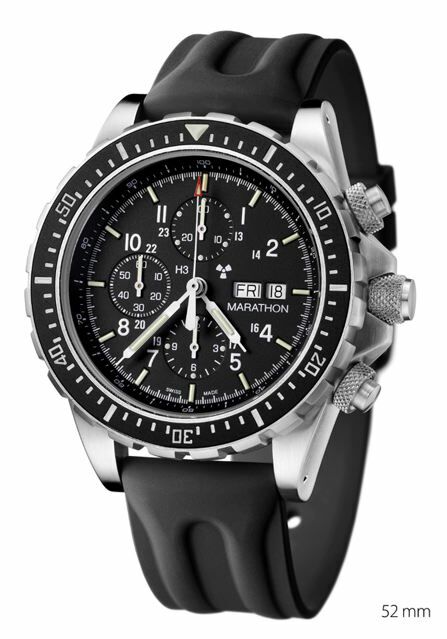 Made by the Marathon Watch Company by contract to the Canadian Government for issuance to their SAR-Techs. Note the latest contract is marked "US Government" on the dial. 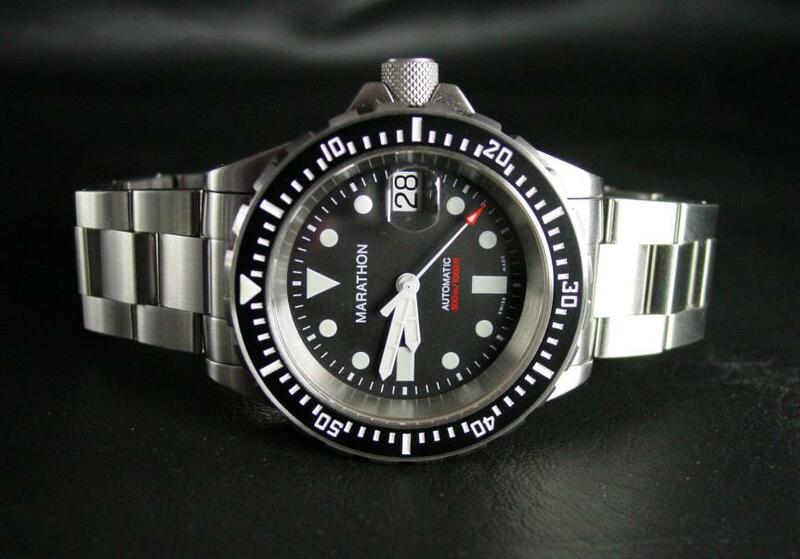 Custom made Swiss manufacture stainless steel bracelet for the Canadian SAR mechanical dive watch. 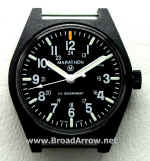 -Fits all generation of SAR watches to date. -TWO STYLES Marathon signed with US "The Great Seal of the US" engraved on back of clasp, or the original Canadian Maple Leaf. Adjustment requires a bracelet adjustment tool. 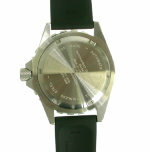 The adjustment should be done by a qualified watchmaker using only the proper adjustment tool. 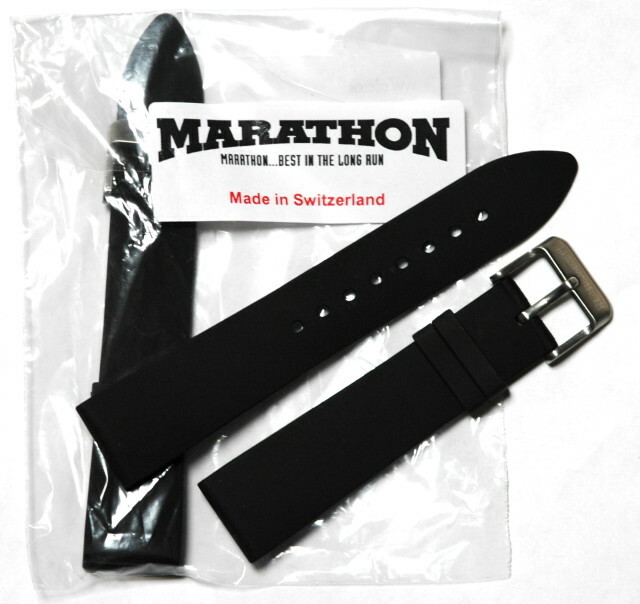 Now in stock, original Marathon factory straps made especially for the SAR and TSAR. These will fit any SAR/TSAR made to date. They are probably the most comfortable rubber strap you will own. 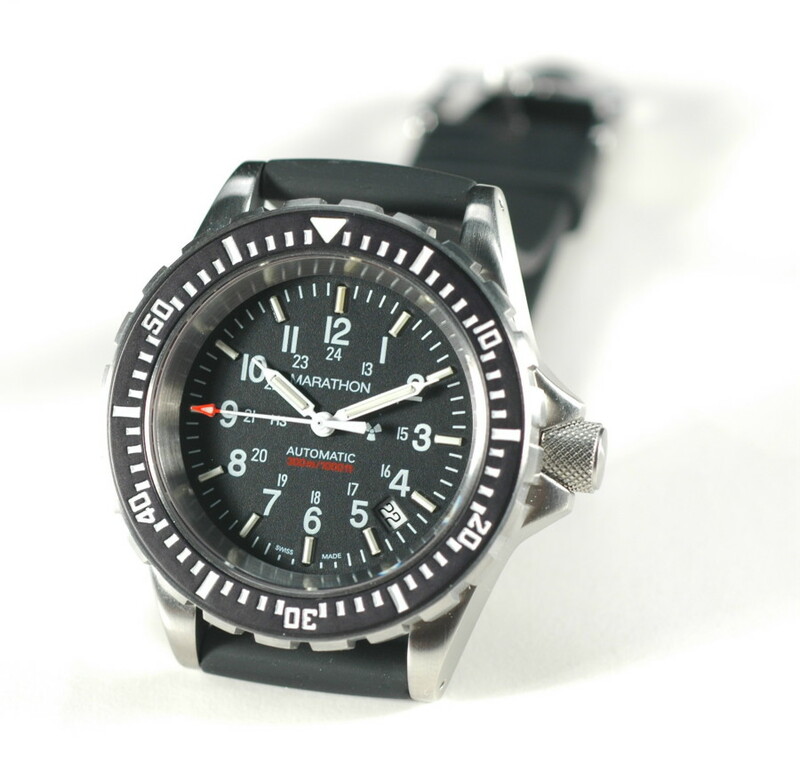 If you tried to buy one for your Ikepod or other high-end Swiss brand, they would charge you $200+. 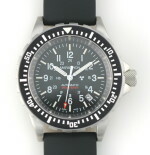 12 Hour GMT bezel. Quartz movement, hacking. Tritium gas-tube luminescence. User serviceable battery. Composite case and acrylic crystal. Nylon issue strap. Water resistant to 6 ATM. 42mm X 11mm x 20mm lug width. 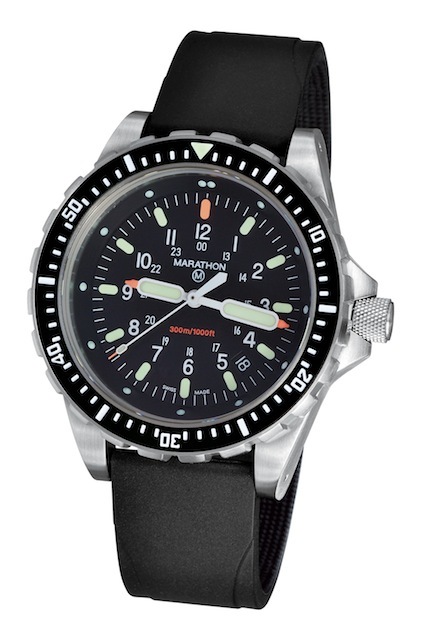 Note: The newest G series is once again sterile (no markings on dial). 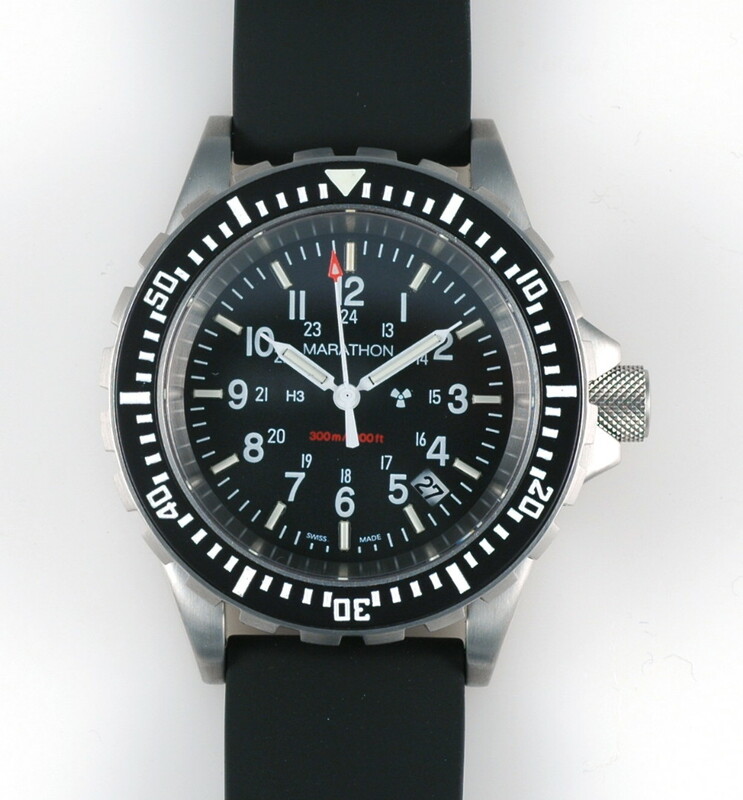 12 Hour GMT bezel. 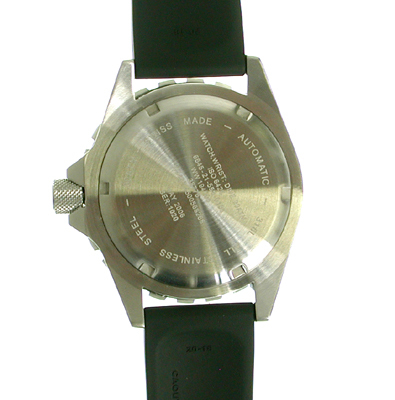 ISA Quartz 1198 movement, hacking. Tritium gas-tube luminescence. Red tipped seconds hand. User serviceable battery. Composite case and acrylic crystal. Nylon issue strap. Water resistant to 6 ATM. 42mm X 11mm x 20mm lug width. Quartz movement, hacking. Tritium gas-tube luminescence. User serviceable battery hatch. Fiberglass/composite case and acrylic crystal. Nylon issue strap. Water resistant to 3 ATM. 34mm x 11mm x 16mm lug width. NOTE: The current spec. 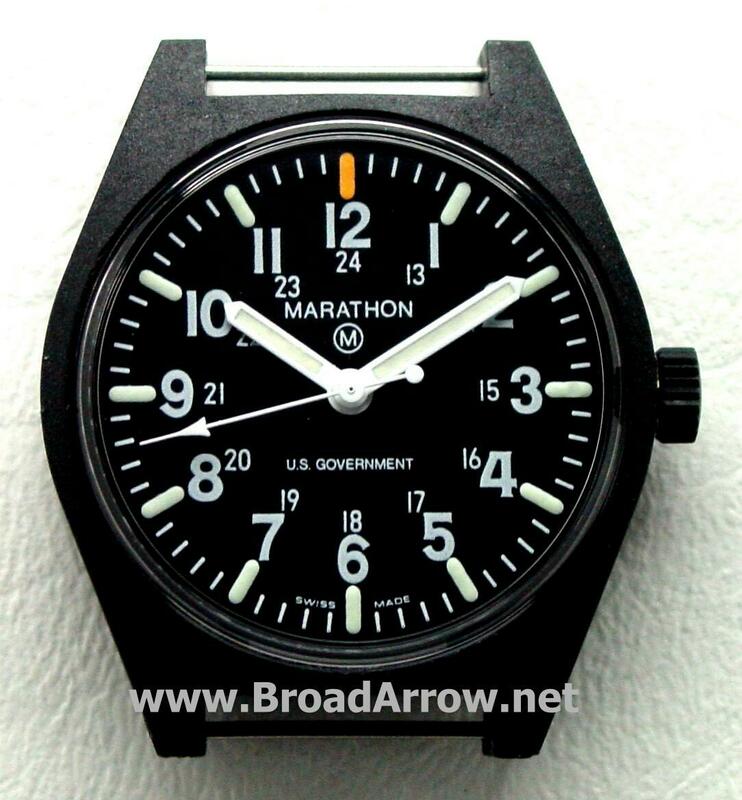 has US Government and Marathon markings on the dial. Not rated for swimming or showering. 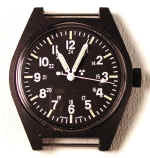 The "Maraglo" Basic Field Watch was built to a Government GSA contract that called for non-radioactive light sources for sensitive environments. Quartz movement, hacking. Proprietary "Maraglo" process. 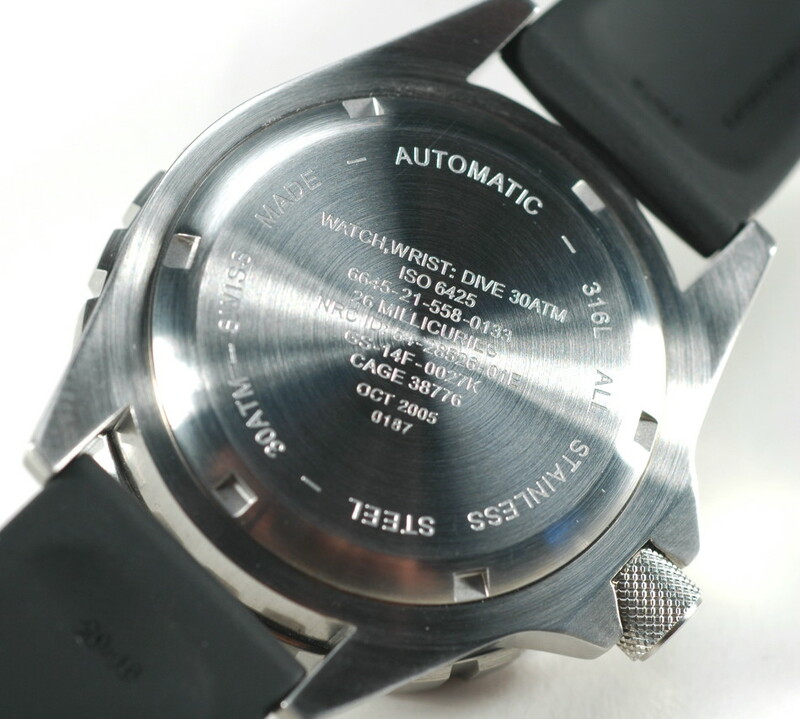 Uses LumiNova material applied in a three step baked on process. Superior illumination and will never breakdown with age. User serviceable battery hatch. Fiberglass/composite case and acrylic crystal. 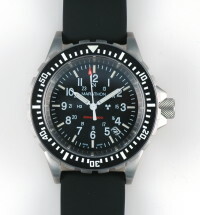 Nylon issue strap. Water resistant to 3 ATM. 34mm x 11mm x 16mm lug width. Note: Not rated for swimming or showering. This is the original SAR on a new 2006 Contract! New Generation. 120 click new and improved bezel (staked triangle). Comes with a new Swiss made natural rubber strap with stainless signed steel buckle. New packaging. 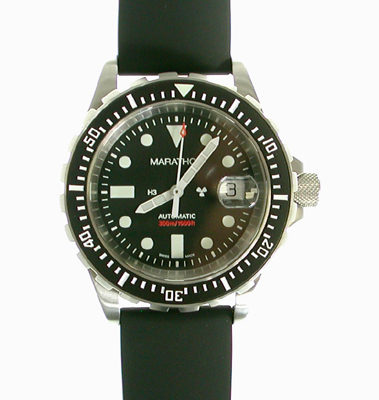 This is a limited opportunity to own the original style SAR with Maraglo hands. 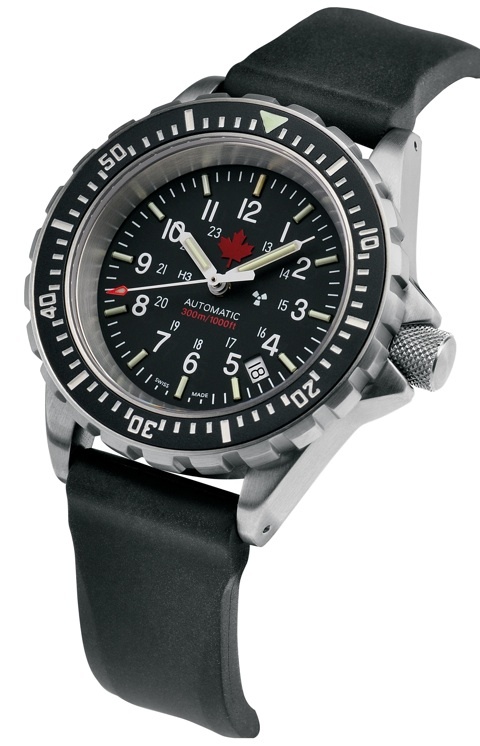 Made for a 2009 Canadian Military contract with a red appliqué Canadian Maple Leaf on the dial. During the last production run, a mistake was made on the dials. 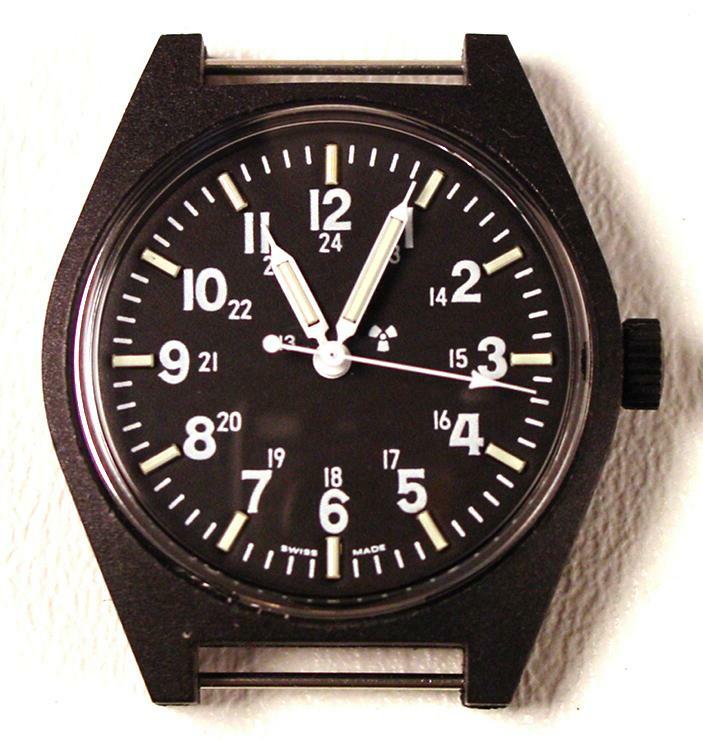 These watches are Maraglo (Luminova), however, they were in advertantly marked with an "H3" and nuclear symbol, designating them as tritium lumed. Because of the misprint, Marathon has decided to sell them at a loss instead of redialing the entire batch. Terms: Checks, money orders, credit cards and Paypal. California residents must pay 8.75% sales tax. * Plus shipping & insurance. Prices to USA only. Ask about international shipping rates. Specifications on military issue watches are subject to change and their appearance may vary slightly from contract to contract.